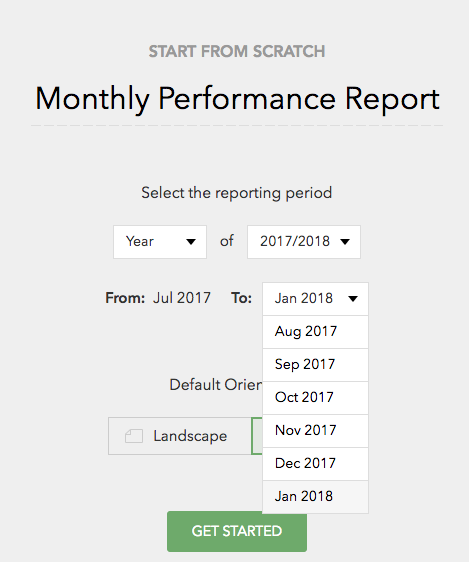 How can I change the ending month for a YTD report? You can create reports for any month, quarter (or QTD) or annual (or YTD) period. When creating a report for a QTD or YTD period, you can select the month which concludes the QTD or YTD period. However, you cannot choose the month which commences the QTD or YTD period. Additionally, each element in a report can be configured to present a different period range of data (eg. a KPI Explorer could be present for the current annual period, and supporting trend charts could show monthly trends). Or, one page of the report could show Cash Flow analysis for the current month, and the next page show Cash Flow analysis for the current YTD period).